A bedroom in a turret and a flexible basement studio are just some of the perks in this soulfully updated home. 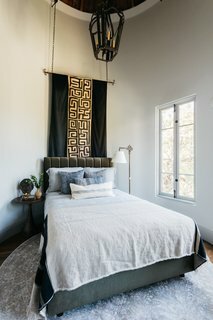 The owners of this updated Tudor-style abode in the Los Angeles neighborhood of Eagle Rock, Amanda and William Hunter, are the design duo behind the William Hunter Collective, which rehabs homes. 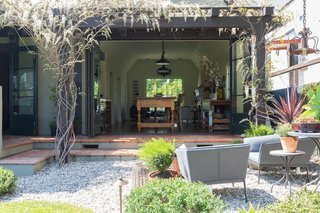 William, an architect-turned-production designer, and Amanda, a graphic designer, gutted and reconfigured the 2,000-square-foot home to maximize space before tapping HGTV host and bestselling author Emily Henderson for the interior design. 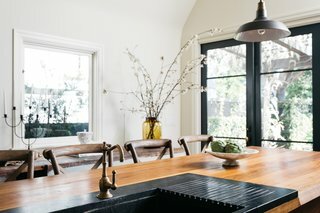 The resulting home blends traditional and modern design elements to create a "timeless and unique space." 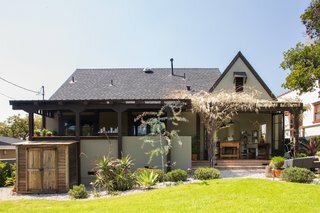 The William Hunter Collective purchased 5222 Monte Bonito Drive in 2006 and gutted the home, making it more practical for modern-day living. 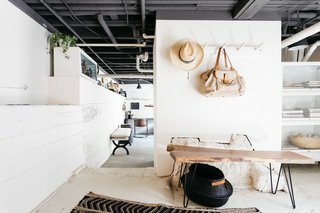 A bedroom is tucked in the terrace, and the residence also has a basement-turned-home office that can be used as studio space. Vintage, one-of-a-kind light fixtures are featured throughout the home. 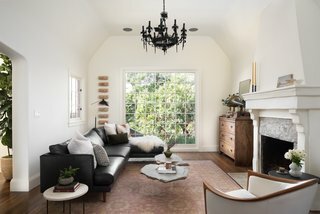 This living room hosted a Target photoshoot last fall, also styled by Emily Henderson. 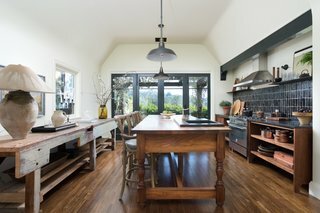 The kitchen features soapstone counters, a walnut island, handmade tiles, and an expansive door that leads to an covered, outdoor dining terrace. The walnut island houses the sink. 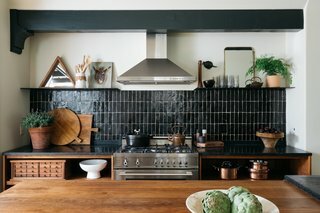 Handmade tile, soapstone counters, walnut wood, and steel make up the artfully styled kitchen. 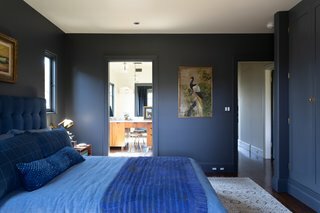 The master suite is a dark and moody retreat. 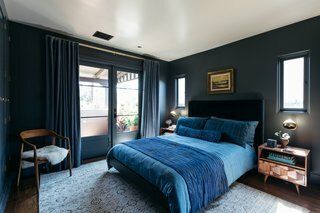 "It's okay to be bold," Henderson says of the indigo-hued bedroom. "I’m still under the impression that almost everyone loves blue, so I think this is not only okay to do, but actually something that can really add value." The color is French Beret from Benjamin Moore. 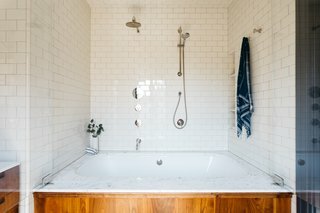 The master bathroom features a coved tile ceiling, a custom walnut vanity, and a large soaking tub. There's no 2 ways about it. 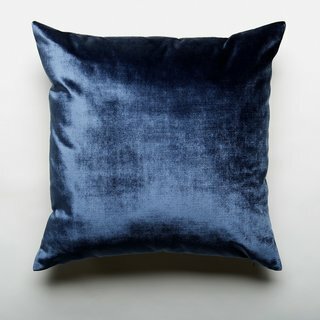 This pillow is a must-have for the sleekly sophisticated. One side shimmery pewter, the other a decadently deep midnight blue, this striking accessory is simple elegance at its best. But the material is where it really shines. Sculptural design. Matte black finish. 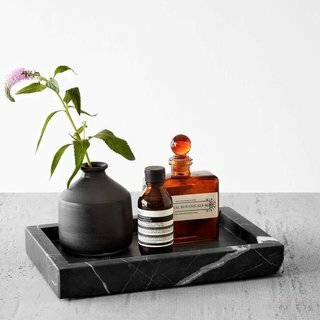 There’s no denying this thick marble tray is one handsome fellow. 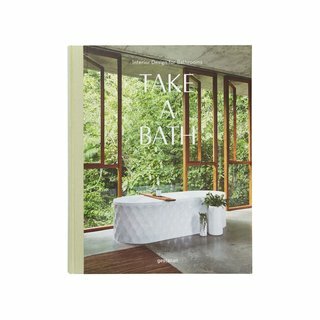 Style it on a coffee table or vanity for a luxe, high-design look. Hand-carved by master artisans in Puebla, Mexico, each piece is made start-to-finish in a fair trade environment. 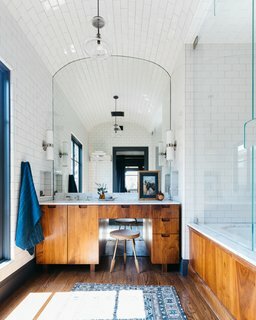 The subway tiles that cover the master bath are from Daltile. 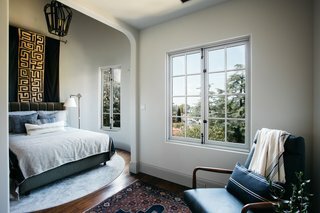 This bedroom is tucked in the turret of the Tudor-style home. The bed was placed just under the turret. 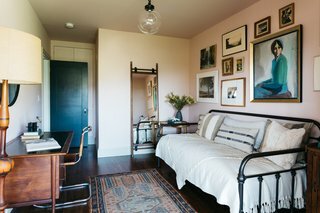 "Vintage and antique pieces have good, storied energy that will make your house feel more like a home and give it soul." 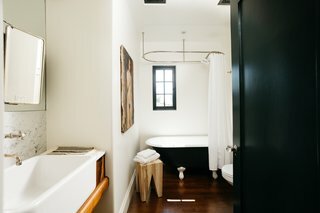 Each of the three bedrooms has unique design elements. The guest bath has a clawfoot tub. 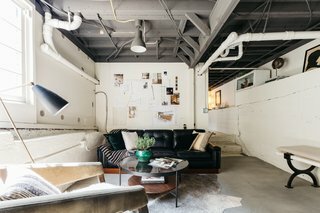 The basement was transformed into a cool, modern office/studio space with an industrial vibe. Although William and his team had worked down here, the space was a storage room at the start of the project. The window is also a recent addition. 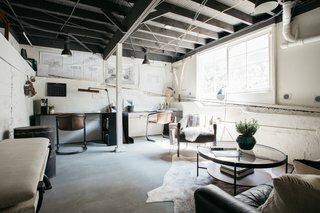 The office/studio space from the other angle. The kitchen fully opens to the backyard. 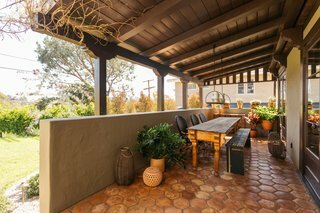 There is a covered patio for alfresco dining. The back of the home. 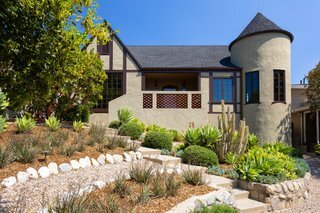 5222 Monte Bonita Drive is now being listed for $1,599,000 with Lauren Reichenberg of Compass.